The story of Stackelroth Farms - an all-female team producing Australia's Halloween pumpkins! Have you ever wondered where your Halloween pumpkin comes from? Well today, on Halloween, we have a wonderful story to share with you – it’s the story of Stackelroth Farms, an all-female pumpkin growing operation situated in Bowen, QLD, and managed by long-term partners Belinda Williams and Michelle O’Regan. Belinda and Michelle have been together as a couple for over 14 years and in that time the Halloween program has also grown greatly. Belinda (left) and Michelle (right) at Stackelroth Farms, QLD, image courtesy Shannon Kirk of De Lacy Kirk Photography. When she was just 23 years of age, Belinda’s step-father, Ian Stackelroth, tragically passed away in a farming accident. Belinda and her Mother, Pam Stackelroth, did not have time to stop. ‘Three days later we were back in the paddock harvesting capsicums, pumpkins and watermelon to keeping the farm running’, recalls Belinda. Belinda has inherited her strength and resilience from her mother Pam; they are both highly respected within the farming community, not only as they are women farmers, but also as business owners and managers. Sunset at Stackelroth Farms, QLD, image courtesy Shannon Kirk of De Lacy Kirk Photography. Belinda supported Pam in her farming ventures until 2007, when she decided to start her own farming entity. 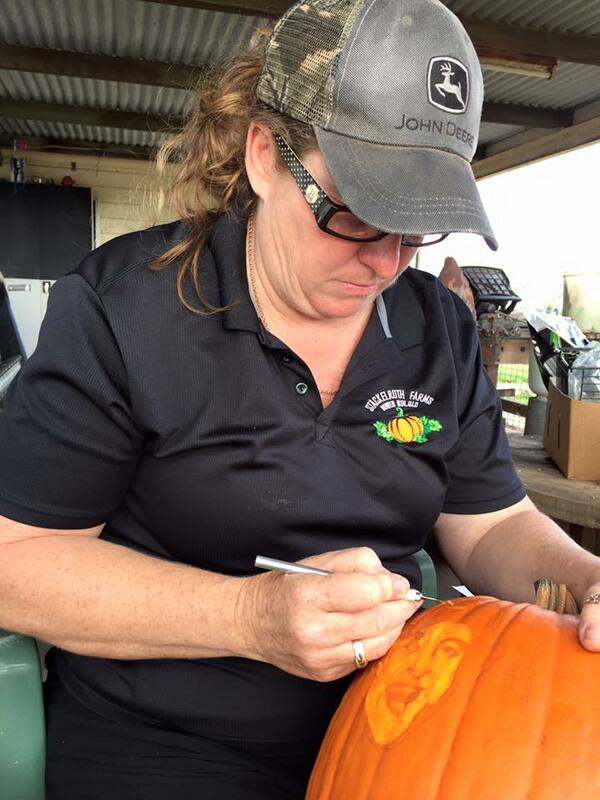 Prior to starting out on her own, the farming company had been trialling Halloween pumpkin varieties as they saw an opportunity to grow the business with the Halloween trend becoming stronger over the past 17 years in Australia. Belinda kept the Halloween program going: ‘it has taken years of research, development and trials to grow the program to the event that is now celebrated nationally’, says Belinda. 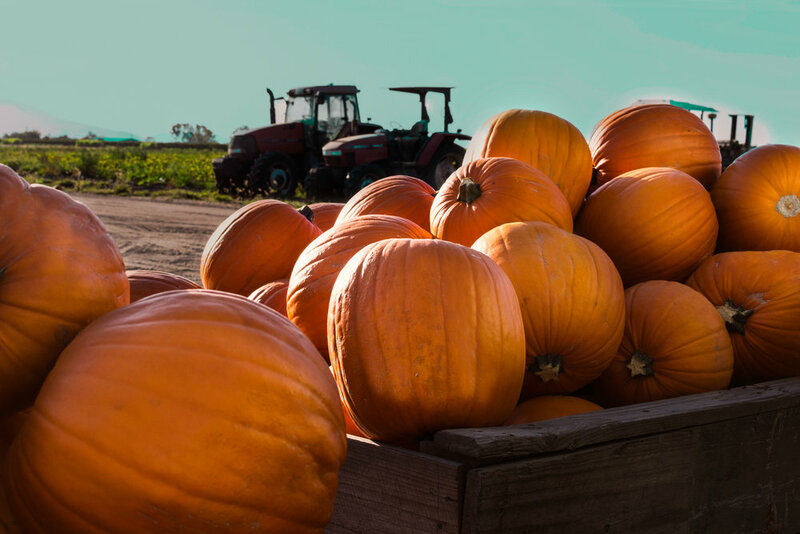 Stackelroth Farms now produces over 500 tonnes of Halloween pumpkins in a joint venture with two other farmers situated in the Burdekin and in Western Australia. Belinda manages the National Halloween Program, in partnership with fruit and vegetable wholesalers MorCo. Belinda with her dog, Stackelroth Farms, image courtesy Shannon Kirk of De Lacy Kirk Photography. Aside from undertaking the planting and prep work on the farm, I take annual leave each year to run the picking crews for our Halloween Harvest. This frees up Belinda to manage the shed and the general business inquiries with the support of Pam. Belinda and I also do direct supply of garden vegetables, locally and within our region, so at the end of a working day and on weekends we are often found in the paddock or back shed harvesting and packing produce for local supply chains. This makes for very long days during the 5-6 month vegetable harvest season but we wouldn’t have it any other way. A few years ago Stackelroth Farms investigated the possibility of employing a school-based trainee from the local high school. A traineeship had not been offered for many years and it was identified that more young people were needed in the industry and there were many barriers to overcome. With this in mind, Michelle’s daughter Stevi-Leigh undertook this traineeship and as a result Stevi has completed her studies and gained full-time employment with Prospect Agriculture, a horticulture consultancy and research business. This has created a pathway for more local farming entities to consider offering traineeships to young people interested in the industry. Michelle's daughter Stevi-Leigh at work on the farm, image supplied (Stackelroth Farms, Facebook). Michelle's daughter Stevi-Leigh at the end of a day's work, image supplied (Stackelroth Farms, Facebook). Belinda providing some hands-on training on how to fix a water leak in a trickle tap, image supplied (Stackelroth Farms, Facebook). Prospect Agriculture has also partnered with Stackelroth Farms and the local Police Citizens Youth Club (Michelle’s workplace) to deliver programs for unemployed and disadvantaged youth, which has seen great results for participants in recent years. It is these kinds of partnerships that Belinda and Michelle believe strengthen communities. Michelle tending to pumpkins, image supplied (Stackelroth Farms, Facebook). Michelle carving Halloween pumpkins, image supplied (Stackelroth Farms, Facebook). With the highlights, though, there have been some significant challenges. 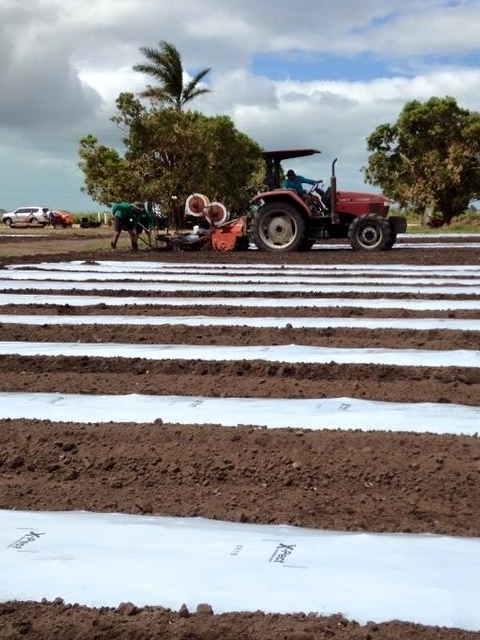 Tropical Cyclone Debbie hit the Whitsunday Region with great force in late March, this saw Stackelroth Farms lose 100% of their butternut crops. Belinda, Michelle, Stevi and a group of wonderful friends, young people and their parents all banded together to pull up over 30 acres of plastic and trickle tape (watering lines) by hand. ‘This was soul destroying and back breaking work’, recalls Belinda, ‘but all the willing volunteers came armed with enthusiasm, fun and smiles which made the heart breaking work somewhat bearable.’ Over 40,000 seedlings were washed away and Belinda and Michelle decided not to replant, but to instead focus on recovery efforts on the farm and working on the Halloween program. Recovery works at Stackelroth Farms following Cyclone Debbie, image supplied (Stackelroth Farms, Facebook). 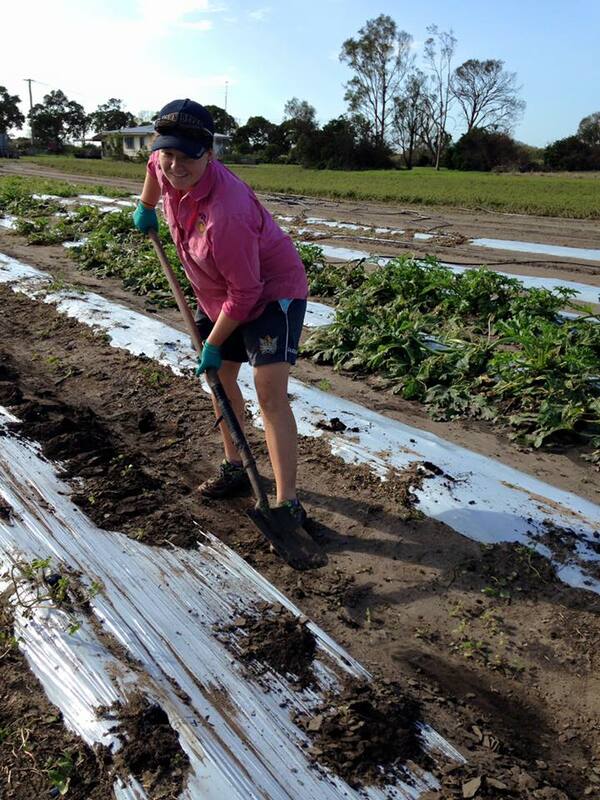 Michelle's daughter Stevi-Leigh working on the cyclone recoveyr efforts, image supplied (Stackelroth Farms, Facebook). Belinda is a farmer through and through; farming runs through her veins and there are no signs of her slowing down. Both Belinda and Michelle see it is very important to bridge the barriers between consumers and farming, which sees them open their farm to families and children some weekends, so that children can learn what goes into growing their food. Both Belinda and Michelle do not see being female farmers, or running a female managed farm, as a barrier; 'we just get in do the job at hand to a good standard', they say. This has brought great respect within their community not only for their produce, but also with the support they provide for young people and community groups. For now though it is business as usual on Stackelroth Farms, where the farming season for 2017 is finishing off. To see what Belinda, Michelle and their team get up to, you can follow their journeys via the Stackelroth Farms Facebook and Instagram pages. Happy Halloween!